Postage stamp sized photographs, some with printed postage stamp like borders, with gummed backs and in perforated sheets were occasionally offered as novelty items from a few photographers from the 1860s until the start of the 20th century. 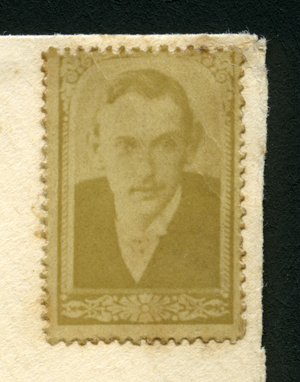 Here we describe the stamp photograph in more detail. The photographic “portrait stamp” was first introduced in 1863 by Alexander Bassano (1829-1913) of Regent Street . By April 1863 these stamp sized photographs were described as a great success and already several young ladies had commenced portrait-stamp collections. (Illustrated Times - Saturday 25 April 1863 p10.) Later that year others were taking up the idea. An advertisement for Mr Aldis, photographer of the Portman Studio, Baker Street, near Madam Tussaud's, listed among his offerings "the greatest novelty in photography - the new penny signature portrait stamp, 120 for 10s., adhesive and perforated." (Marylebone Mercury - Saturday 26 September 1863 P1). The following year the North of England Photographic Company 6 Ridley Place, Newcastle and Henry Street Carlisle were advertising: "Your portrait for a penny. The new penny adhesive portrait stamp used instead of signatures in writing to friends, 8s 4d per hundred" (Newcastle Guardian and Tyne Mercury - Saturday 18 June 1864, p1). This stamp photograph is reproduced by kind permission of Daniel from Cinderellastampforum.com. The border is believed to be copied from the penny lilac issued from 1881 to 1901 with the dots in the corners and an oval frame. Photographer and subject currently unknown. We would welcome more examples in the hope that we might eventually be able to associate particular styles with individual photographers. 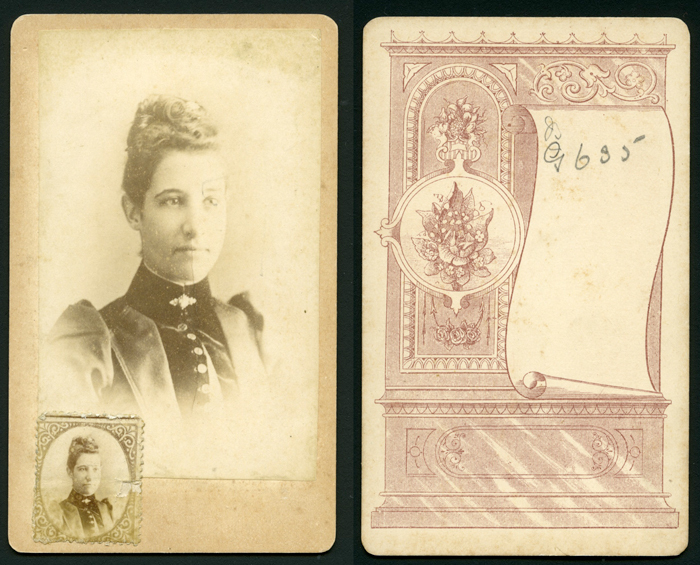 These examples, which do not have perforations, have been fixed to a carte de visite mount so that they can be shown in a photo album. Photographer unknown. 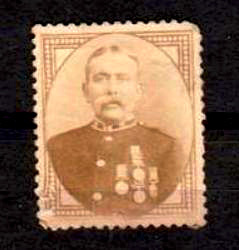 This example shows a perforated stamp photograph stuck onto the carte de visite from which it was copied. There are no details of the photographer who took the carte de visite or the photographer who made the stamp photographs. The stamp is 2 x 2.5 cm. This carte came from the album of Fanny Pearce, b: 24 Oct 1871 in Gosberton, Lincs. The photograph may be of Fanny, or one of her sisters; Lydia or Florence. The carte de visite was a donation to help with fundraising for St Bartholomews Church West Pinchbeck, Lincs. 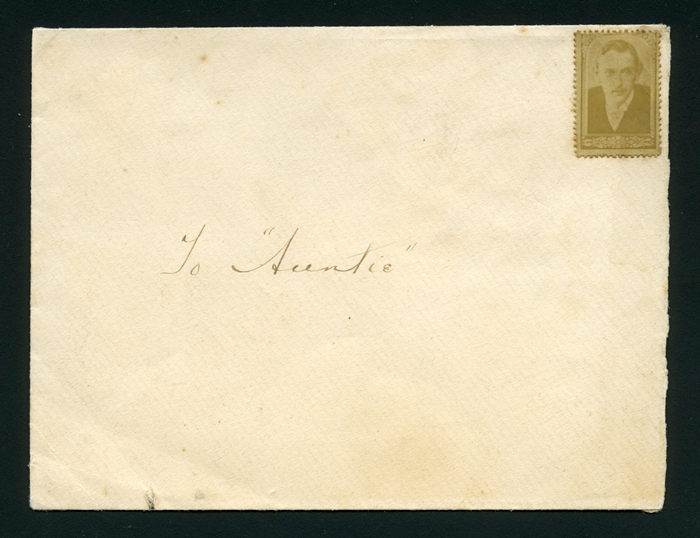 This example, affixed to an envelope, addressed to "Auntie", measures just 1 inch x 3/4 inch. It has something of an ornamental border and is perforated 17 to 2cm. The image is of an unknown young man, date unknown, possibly around 1900. This example is by Francis - see below, reproduced from an article in a French periodical, La Nature, 1891. It is an engraving, an illustration from an article by G Mareschal on "Photographies Timbres-Poste", a novelty photographic format. Note how the engraver has incorrectly shown two rows of perforations between the stamps. Edinburgh Photo Company 7 Leith Street, Rutherford’s Stair, Top flat. Beautiful postage stamp photographs of actresses 100 post free for 1s 8d; 25 for 6d. A curiosity. Your picture reproduced by photography and made in sheets perforated and gummed the size and style of postage stamps. By using the novel portrait stamps you can affix your portrait to all your letters cards, books etc . Your picture reproduced by photography and made in sheets, perforated and gummed, the size of postage stamps. By using these novel portrait stamps you can affix your portrait to all your letters cards books &c.
Your photograph reproduced in the style of portrait stamps 50 for 3s 6d perforated and gummed. New POSTAGE STAMP PHOTOGRAPHS, which are equal in every respect to a first-class Cabinet or Carte. Being perforated and gummed, like postage stamps, they can be stuck on Visiting Cards, Envelopes, Programmes, &c,, thus forming an excellent advertising medium. They are similar in size to the ordinary postage stamp and in a neat artistic border bear a well executed reduction of the carte de visite or cabinet photograph of the person who desires to use these admirable mediums of personal advertisement by affixing them to letters, circulars &c.
the latest novelties hit upon by the ingenious photographer. As a work of art the portrait-stamp has much to recommend it; to egotistical persons and adventurers it ought to be treasure. You simply send in your ordinary carte to have it reduced, and the result is surprising. 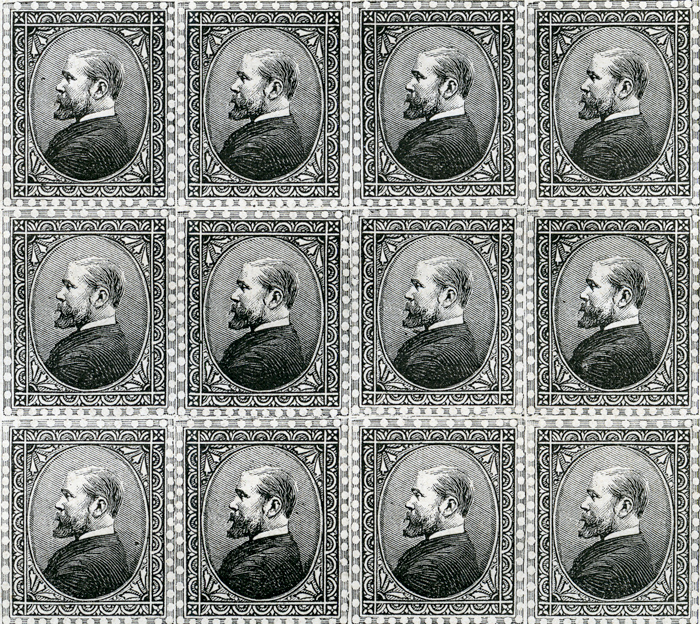 Photograph of a design for producing stamp photographs, an oval in a rectangular border. Copyright owner and author of work: George Piner Cartland, 7 High Street, Eton. The National Archive COPY 1/404/441 and similar at COPY1/404/473 Registration stamp: 24 June 1891. “An elaborately planned suicide” - reporting on the death of Sergeant Horace Tarrant. "Much sensation was also caused by the production of a number of visiting cards which were found on the deceased. Each card bore a loving memorial inscription to members of the family and friends, and pasted upon each card was a small stamp photograph of himself." The Portrait Stamp Co 2 River Street, Bedford. Seaman's, Mint Street, Lincoln. See our page of additional information about the Seaman family. Edward Seaman patented a printing frame for stamp sized photographs in 1895. W Tylar 41 High Street Aston, Birmingham. In around 1900 James Whyte designed and sold a "Photo Stamp Album and Autograph Book". The book measured 9.5 x 6 in and had a thin card cover - reminiscent of the kind of albums used for cigarette cards. The book was marked out in rectangles for 180 stamp photos up to 1.25 x 1.5 inches in size with a space beneath each for a signature. The album was printed by J and J Murdoch of Glasgow and sold for 6d. A non perforated stamp sized photograph of Whyte appeared on the flyleaf, where he also offered "Your own photographs 12 for 1/-"
Cambridge University Library 1900.9.87, acquired in 1900. The first advertisement below appeared in The Stage 25 Jan 1900. By April that year the second advertisement took its place, with slight variations over time, in a range of different local newspapers. The advertisements ran until March 1902. The Stage 25 Jan 1900. Numerous other newspapers 1900- March 1902 including: Lincolnshire Echo, Lichfield Mercury, Swindon Advertiser and North Wilts Chronicle, Cambridge Daily News, Peterborough Advertiser, Warminster & Westbury Journal, and Wilts County Advertiser, Kerry Evening Post, Cornish & Devon Post. This is the range of the campaign picked up by the indexing of the British Newspaper Archive - there were probably advertisements in additional newspapers not included in the Archive or found by its index. Interestingly Cambridgeshire was clearly targeted by the campaign, and so some of these early stamp photographs are likely to crop up in Cambridgeshire family albums. 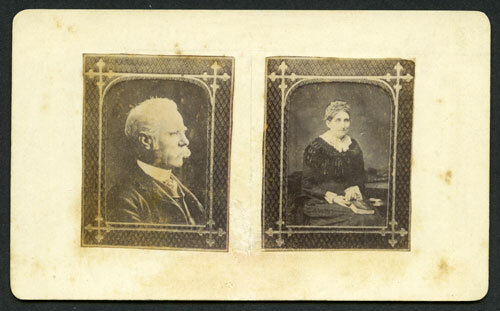 The photographer, working from the customer's carte de visite, would have to copy part of the original carte, then make a number of prints from the negative, cut these out and paste them into a sheet of empty frames, re-photograph the whole sheet then print whole sheets from the resulting negative. Finally the sheets would need perforating with a hand or treadle perforator. Later it became easier for photographers to produce these stamp photographs, but by then they were going out of fashion. 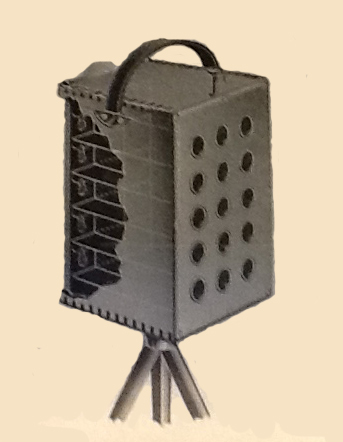 In the Photographic News Yearbook of Photographs and Amateurs Guide for 1907/8, Messrs Butcher and Sons of Camera House, Farringdon Ave London EC were offering a "Royal Mail Stamp Camera" (shown below) which simultaneously took 15 portraits or views on a quarter plate film. Ready perforated photographic print out paper was supplied so that a print taken from the negative was ready immediately for forming into postage stamp portraits. The complete kit cost just twenty five shillings. A better illustration of this camera and its operation can be found on the fabulous earlyphotography.co.uk site.